The count down is on. There are less than two weeks until the 2015 Boston Marathon and the infamous “tapering” phase is now in full swing for me. But to reach this carb-loading, easying up phase I had to do one last long run a week ago. And it was my first time running the actual course. After months of training in challenging winter conditions, I was feeling pretty nervous about whether I would be ready for the big day and the notorious “Heartbreak Hill.” I had felt good on all my long runs, but many of the week-day runs had to be cut short or never happened because of brutal cold, ice and snowy roads. So when I heard that New Balance and Marathon Sports were sponsoring a 21 mile run on the course, I jumped at the chance…then got really nervous. 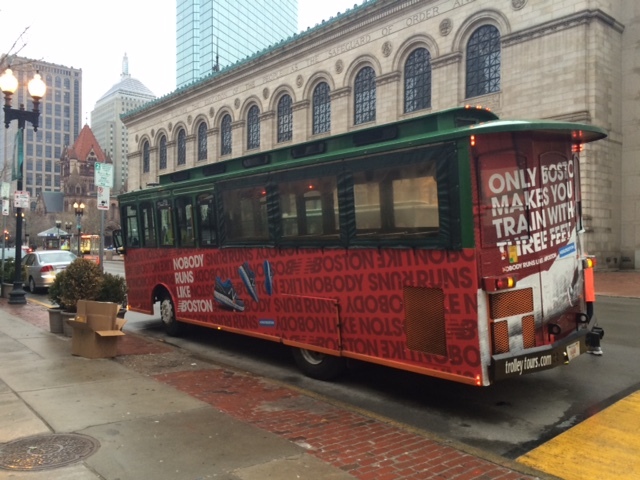 Because so many runners work hard to qualify for the chance to run Boston, it seems the training surrounding this marathon is more intense than others. I did not qualify, rather I earned my bib number by raising money for a very worthy cause (there’s still time to donate, please click here), and I’ve been training in a relative vacuum of isolation; running all by myself, on basically the same course (along the Charles River). I started reading “26 Miles to Boston,” which was recommended to me by just about everyone, but it really messed with my head. Every page had a reference to hill repeats, track work or speed workouts. I had done none of the above. I have just run around the Charles (and a few other bodies of water: the Seine and Wissahickon) a lot. Suddenly, despite intellectually knowing that I am not a Kenyan, I started getting nervous that I was not ready…to win the marathon. Instead of focusing on the good I was doing by raising money for The Children’s Advocacy Center, or revel in the experience that is running Boston, I felt my competitive juices starting to flow and my mind getting focused on hitting a certain time (my previous marathon time of 3:56:05). So the night before this last long training run I was nervous the way I would be before a job interview. Yes, I am indeed insane. 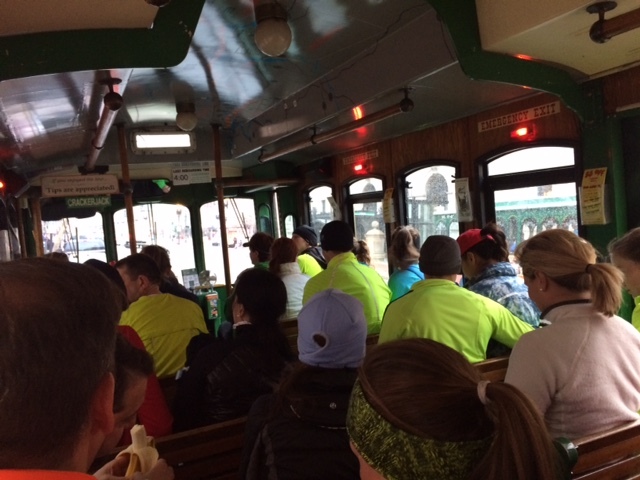 We gathered at Marathon Sport at 7:15 a.m. and dozens of us filed onto trollies for the 21 mile ride out to mile 5 of the marathon in Framingham. During the long trolly ride it started to sink in how far away we were headed and how far I was about to run…in the snow. Oh, did I forget to mention that it was snowing? Huge fluffy flakes. It was at that moment when I realized I should have reviewed the actual course before embarking on this run. I asked the person sitting next to me if there was any way I could get lost (because if there was a way I would likely find it). She assured me that there wasn’t. “It’s all straight and then a right at the fire station.” I mused that this fire station better be really obvious. At that point I was really getting nervous, I decided to run with my phone in case I needed to be rescued by Uber, and I missed the group picture because I was peeing behind a tree. We started out on the road (I guess it was RT 135) and I immediately realized that everyone had been right; there is just something about Boston. My first sign was right there in front of me: hundreds of runner on the shoulder of the road. And there were folks out cheering for us. Some had signs, some had cow bells, some had water, cookies, bananas. This wasn’t even race day and we had a cheering section for 15 miles. 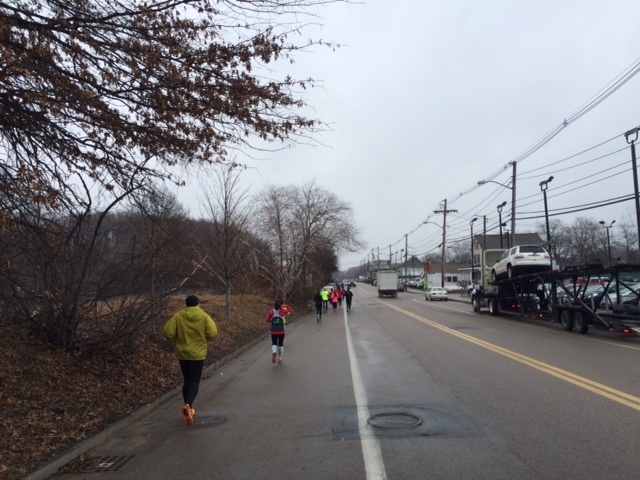 Police officers in Newton set up orange cones and stopped traffic so we could run unencumbered by cars. After about four miles my running watch decided that the only display it liked was the direction in which I was running. Why any runner, unless they were involved in The Amazing Race, would need to know that they are running northeast is beyond me. I could no longer log how long I had been running, how far I had gone or my pace. So I had to rely on more primitive means; I shut everything else out and concentrated on my breathing. I should not be huffing and puffing at mile 6, so if I was, I needed to slow down. I listened for church bells to mark the hours, and when I saw a lot of running related litter (gels, goos, etc. ), I had a goo too to keep my energy up. It was great to get a sense of the course, because despite how sad this sounds, my first time in some of these towns was running through them that day. 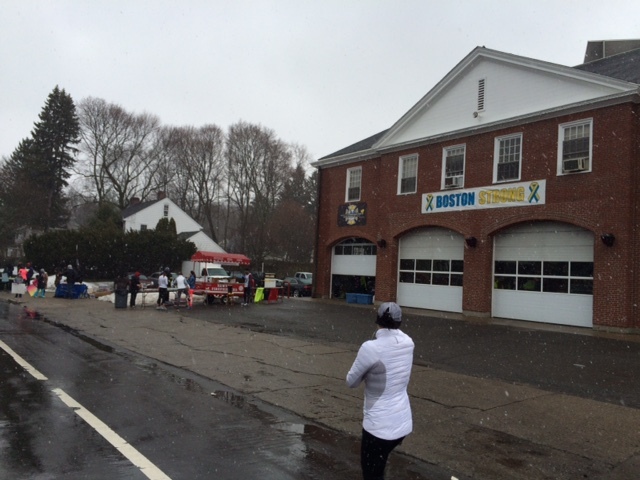 And yes, the infamous Newton Fire Station is obvious (thank goodness!). There I took a right turn, signalling the end was if not in sight, at least less than 9 miles away. When I got to BC I asked a fellow runner where Heartbreak Hill was. She said I had already passed it. I was elated, it wasn’t even that bad. Just three hills followed by downhills where you can recover. I told her that was the best thing she could have possibly said to me at that moment. And it was the truth. The runners really thinned out after mile 21 (it seems many planned a run from the start to mile 21, as opposed to mile 5 to the finish), and I did manage to get lost. How did that happen, you may ask? Well, my terrible sense of direction is not solely to blame. A friendly runner thought I was on her Dana Farber team and took me to their meet-up location and I didn’t know enough to realize that the marathon course does not in fact go though the parking lots at BC. I tried to find my way back but ended up on Comm Ave. instead of Beacon Street. I actually had to ask for directions from someone on the street. But I got back on track after only running one extra mile. When I finally saw the Citgo sign I felt a surge of energy. The end was near. By the time I turned onto Boylston I was dodging pedestrians in nearly and all-out sprint (or as sprinty as I get after 22 miles). When I crossed the finish line (or, more accurately, the sidewalk next to it) I was so relieved, and excited. Relieved because I knew that if I could run 22 I could run 4 miles more on Marathon Monday. And excited because if I had this much fun on a training run, imagine how great the actual marathon will be! I also felt really proud. I had been training (in one way or another) everyday since December 17th and I was ready. The snow did not stop me, the freezing temperatures did not stop me. I had put everything I could into training, and now it was time to taper, rest up and get ready. I have just two weeks to go, and I really could not be more excited for this experience. Will I push myself to beat a certain time? Probably (did I mention 3:56:05?). But I also know I want to savor each mile, and all my friends and the crowds along the way. Just like when my watch broke, I am going to try to tune everything out and just be in the moment, absorb everything around me, and enjoy the run. Yes, there are only two weeks to go before the marathon, and only two weeks left to donate to my fundraising efforts to benefit the Children’s Advocacy Center. If you have not done so already, please consider donating today. You can do so here. Great blog! Your enthusiasm is contagious! So proud of you, Emily! Sounds like a great training run (even the BC parking lot). Can’t wait to cheer you on April 20th! Hi, I ddo think this is a great site. I stumbledupon it ;)I am going to reeturn yet again since i have bookmarked it. Money aand freedom is the best way to change, may you be rich and continue to guide other people.